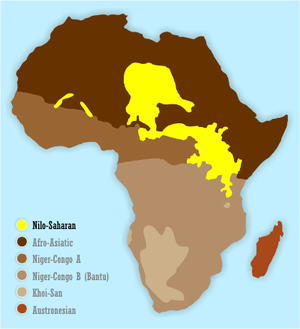 The Nilo-Saharan languages are a family of African languages. They are spoken by around 50 million people, who mainly live in the upper parts of the Chari and Nile rivers. The languages go through 17 countries in the northern half of Africa: from Algeria to Benin in the west; from Libya to the Democratic Republic of the Congo in the center; and from Egypt to Tanzania in the east. This page was last changed on 10 March 2014, at 12:16.